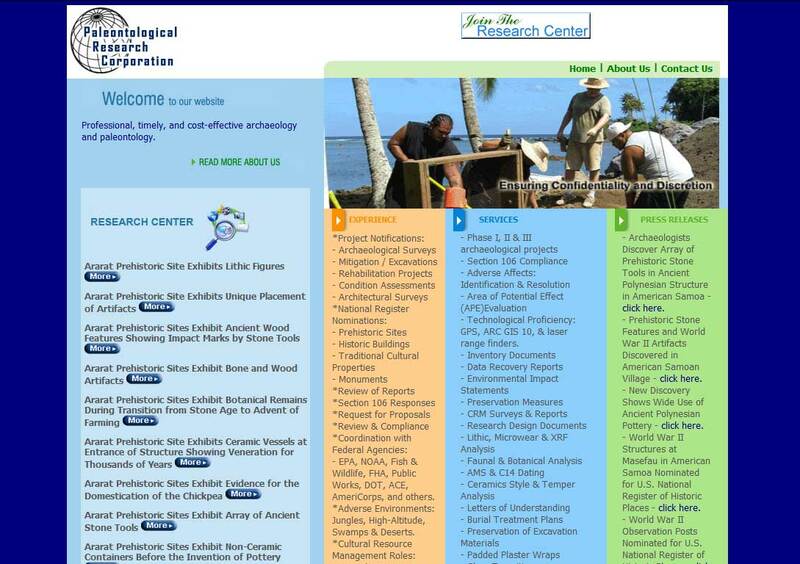 DESCRIPTION: The Paleontological Research Corporation website was designed and developed by PTC Computer Solutions. Professional, timely, and cost-effective archaeology and paleontology.. You can find out more by going directly to their personal website, www.paleorc.com, or contact them directly at jklenck@paleorc.com or 904.444.1576. Paleontological Research Corporation is just one of the many websites designed and developed by PTC Computer Solutions of Jacksonville, Florida that has aroused my interest. Though PTC is a Jacksonville based web design company, they have worked in many international locations including clients in 34 states and 17 countries. Contact PTC at info@ptccomputersolutions.com for the ultimate in SEO (Search Engine Optimization) and to improve your Search Engine Awareness (SEA) improving your Search Engine Rankings (SER) and your exposure on the web.